As travel experiences go, a lost passport on holiday can be a real nightmare scenario. Not only will it disrupt your travel plans significantly, it can send you straight into a spiral of panic. Have you ever lost your passport on holiday abroad? We’d love to hear your story. If you do lose your passport abroad, remember to follow these steps. Find the nearest embassy or consulate. Gather all the supporting documents. Wait for the replacement for your lost passport. Learn some tips from travel experts. When you’ve lost your passport, you’ll start by retracing your steps and calling up every restaurant, bar, and shop you went into out of sheer desperation. But a lost or stolen passport in a foreign country doesn’t mean you are stuck there forever. It might be the part of the holiday that tests your patience the most. Unless you experience a flight delay or cancellation, of course. If you’re reading this and you’re in a lost passport mess, we want to help you get your trip back on track. Here’s what to do. Follow AirHelp’s five-step plan on how to get your passport replaced as soon as possible. So you’ve looked everywhere and simply can’t face searching anymore? Take a deep breath. First off, find your nearest police station and file a report. This will be essential for any travel insurance policy and is important information you’ll need to bring to the embassy or consulate. Be aware that this won’t necessarily speed up the process of a new passport, so if you have urgent travel plans to return to the US, you might want to skip this step. Next up, call the National Passport Information Center so that you can officially register it as lost. If you struggle to get through, you can complete a Form DS-64, and mail it. You can download this form from the US Department of State Website. NOTE: once you’ve officially registered your passport as lost or stolen it is no longer valid. It cannot be used for travel. Now’s the time to locate your closest embassy or consulate as they will help you apply for a new passport. You can locate the one nearest to you on USembassy.gov. Ring ahead and book an appointment, and be sure to inform the consular officer if you were the victim of theft. It’s also important to be clear about when you are leaving the country. A bit of research beforehand won’t hurt. Try and locate your country’s embassy before you travel. That way you won’t be caught out without internet. 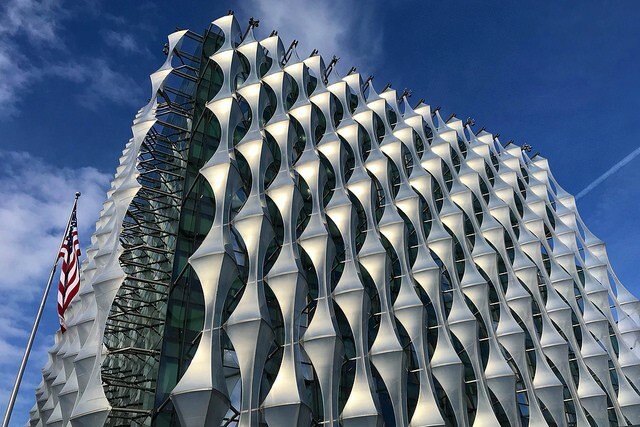 US Embassy in London, UK. So your appointment at the embassy is coming up? It’s time to get prepared. In order to replace your passport, you’ll need to submit some documents with the application when you arrive at the embassy. Identification document (driver’s license, expired passport etc). Evidence of US citizenship (birth certificate, or a photocopy of your passport if possible). A police report, (this isn’t mandatory, but will help confirm circumstances of loss or theft). DS-11 Application for Passport (may be completed at the time of application). DS-64 Statement Regarding a Lost or Stolen Passport (this is where you describe what happened). Unless you are the victim of a serious crime or a natural disaster, you will be expected to pay the normal passport replacement fee. Fees will vary depending on your circumstances. You can calculate how much you will be expected to pay using the Passport Fee Calculator. If you are in the US, replacing a lost passport can take between four and six weeks. However, if you are abroad and have immediate travel plans back to the US, you will be issued with an emergency passport within 24 hours. Be aware that this emergency passport will only last you for the journey back to the US — you’ll have to get a fully valid passport when you return home. The time you wait for your replacement passport may feel like a lifetime. But instead of dwelling on what happened, use the time to learn some new travel tips from the experts. We also contacted some expert travelers ourselves and asked them for their advice on the process of getting a new passport. It always helps to travel with an extra copy of your passport scanned on your phone, on email, or printed out to prove your citizenship status. Namrata Bhawnani, Co-founder of Ecophiles. Rather than having to find a place to get a spare photo, why not carry a few with you? When I traveled across the border from Thailand to Cambodia, I had to provide one as part of my visitor visa. While I could have taken one at the border, it was a long wait. In this situation, it was handy having spare photos with me. Ernest Shahbazian, Founder, and Owner of Trip Astute. I lost my passport three years ago one night I went out in Bucharest’s old town. It worked out just right as within the European Union, a national ID card suffices for citizens of a member country. Inma Gregorio, travel blogger at A World to Travel. Are there any tips you can offer other unfortunate travelers who lose their passports? Leave a comment below! Flight delays happen, but that doesn’t mean you have to accept them. You may be entitled to as much as $700 in compensation if you experienced a delayed, canceled or overbooked flight within the last three years.